How the color of your photo looks depends on both the "temperature" of the light source illuminating your subject/scene and the white balance setting on your camera. 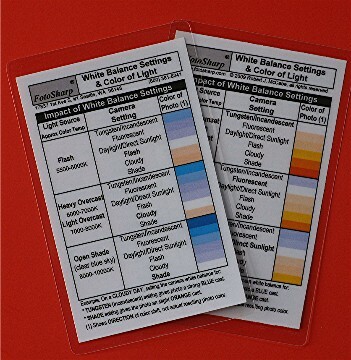 This handy 3.5" x 5.5" laminated cheat sheet shows you how different camera white balance settings can be utilized to change the resulting color of your photos. Make a photo taken under midday sun look like it's taken at sunset. Make a photo taken with a flash look like it's taken at sunset. Make a photo taken at sunset like it's taken midday.